Like we’ve said before, it’s a GREAT time to be in Charlotte. Even if football season is over, there’s more than enough to love about being in the 704 right now. Here’s a short list of stuff we love from The Dunstan Group! If you spend any time at all near uptown Charlotte, you’ve probably noticed there’s a ton going on within the loop. When we see our clients and friends from Heede Southest with their cranes dotting the Queen City skyline, we KNOW big things are happening! Plus lots of new small businesses opening up, the restaurant scene continues to offer new and more diverse options, and then some. What’s not to love? Whether it’s your company’s gift to the United Way, your church fundraiser or mission trip, a charity 5K or bake sale, folks here in Charlotte seem always ready to give for the greater good. Over the years, The Dunstan Group has been lucky enough to be associated with folks doing that kind of greater good, like Cookies for Kids Cancer, 24 Hours of Booty, All In to Fight Cancer, Charlotte Stands for Heroes, and more! Yes! We’re lucky enough here in Charlotte to be close enough to some of the most beautiful country – in the entire country, we’d argue. In just a couple of hours drive we can dip our toes in the sand, or get our heads in the clouds. With all that Charlotte has to offer in a mid-to-big sized city, how many of our peers can say they’re this close to getting away? 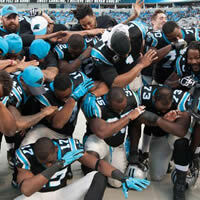 Sure, the season ended on a heartbreaking downbeat, but this year’s Panthers gave us all something to cheer about. And for the first time in a long time, it gave our Super Bowl party some real meaning. The only downside we can see, is that with all the attention we got along the way, the secret is now ALL the way out about what a great place Charlotte is! #KeepPounding, y’all!